The lawmen of Tombstone; ready to re-enact a fight. February 9 – 12, 2017. 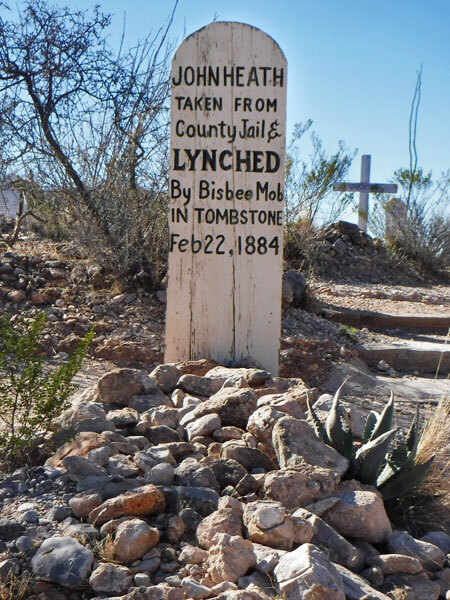 We had Tombstone in our sights. 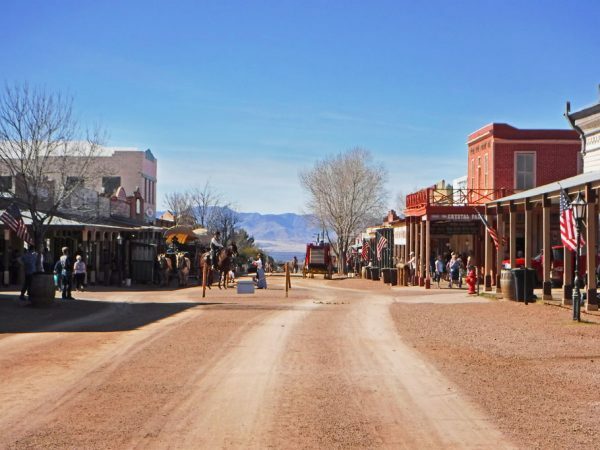 Gunslingers, lawmen, and gamblers, the swinging doors of gritty saloons, marked cards, the smell of stale whisky, colorful dance hall girls, covered wagons on dusty streets, the Earps, Doc Holiday, the O.K. Corral, and visions of Val Kilmer saying “I’m your huckleberry.” Awesome – we were psyched, except for one little problem, where to stay. Back in Tucson, I had search intently for some sort of camping area near the legendary old west town to no avail. 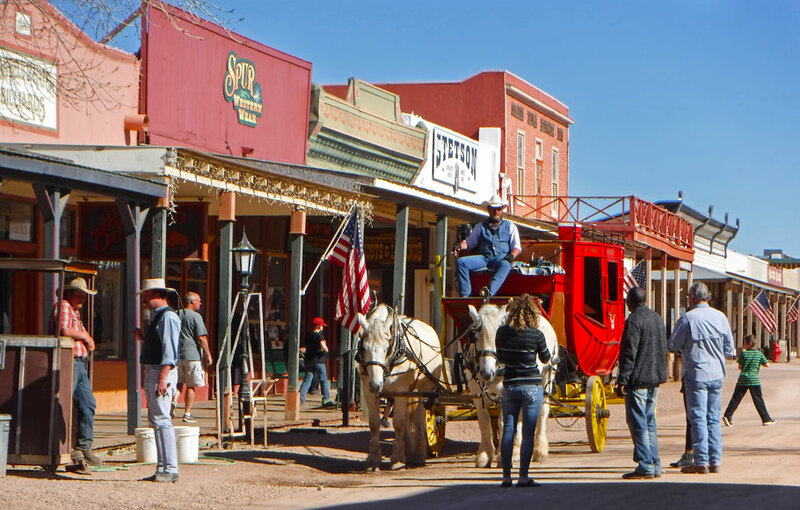 Not that there aren’t plenty of places to park one’s rig in Tombstone and hang out for a few days – just none in our limited price range: free to free. The closest place I could find using all my regular online sources was a little out of the way, over a half hour drive up rough roads in the National Forest. Never-the-less we wanted to see Tombstone, so we headed east across southern Arizona to “the town too tough to die” hoping an option might pop up on our way. After doing some sightseeing en route, during which, no one flagged us down and said, oh please come camp here for free, we drove on into town, hoping if it came down to paying the prices would be reasonable (not), found a parking space, and tried the internet one more time. I thought I’d try a tip I learned back at the Rubber Tramp Rendezvous and see if any bloggers had written about free camping near Tombstone. 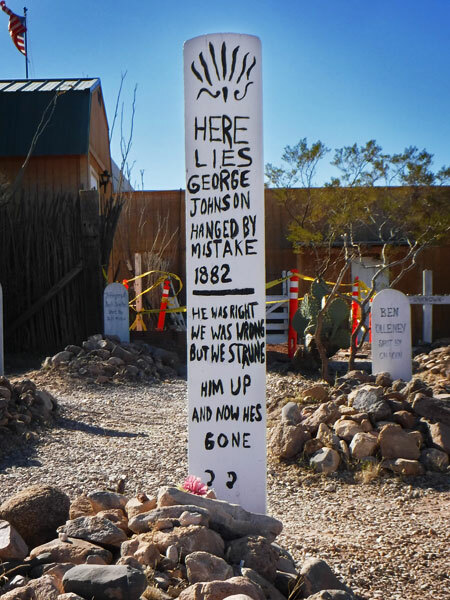 I plugged in “Tombstone boondocking” into Google and was surprised to get a few hits. 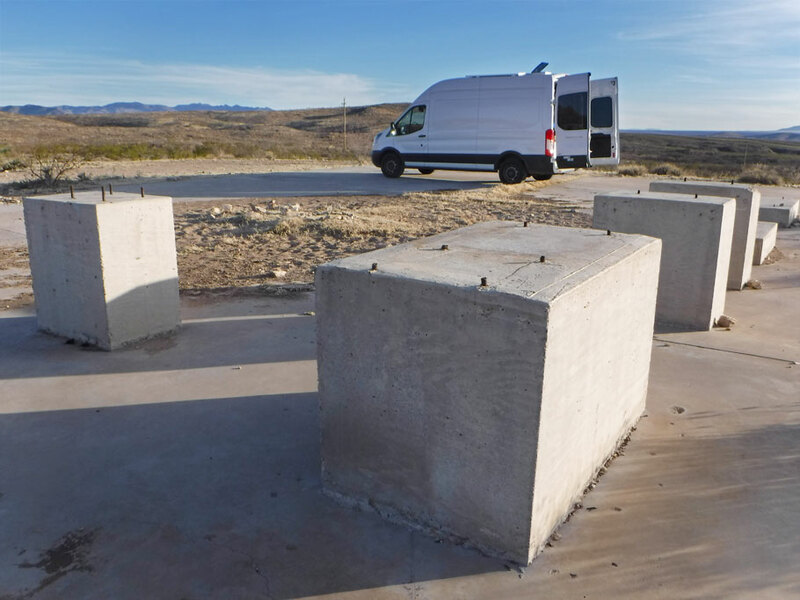 I clicked on the first, a blog post that described in great detail what sounded like an amazing BLM site just a few miles away with nice level concrete pads to park on. Cool! Except in the very first paragraph of the blog post they make it clear that this is a “secret boondocking site” that is only known to an “elite group of elite boondockers” and that they have been sworn to secrecy to not tell where it is. Really – cross your heart and hope to die? OK – fine. I went on to my next hit – another blog post by another blogger, which described the same location and the exact same event and exact same people as the previous post. Yeah, OK – next, third times a charm, right? Nope. Third blogger was at the party too! Apparently I had found the “elite group of elite boondockers” and they weren’t going to share this primo location with the likes of me. Back to Google, I kept searching. I gave up on the blogs and started clicking on the links for forum posts. Not surprisingly, other people have asked the internet where to boondock near Tombstone. And lucky for me, someone (Perhaps a rebel breaking the sacred bond of secrecy and surely risking dire repercussions from “the elite”) gave up the info. Down Charleston Road between mile markers 12 and 13. The spot was great as advertised. 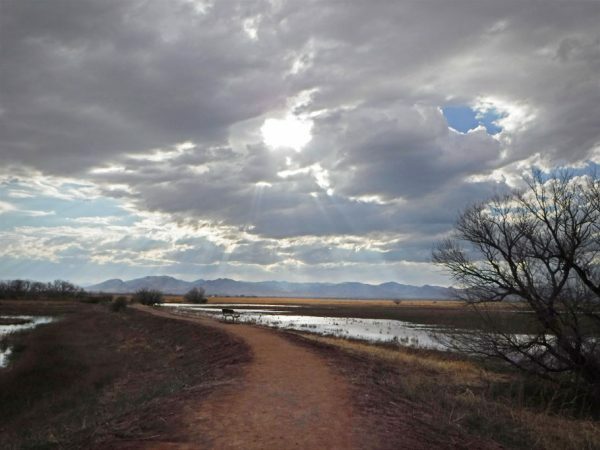 Close to Tombstone, Sierra Vista (a nice sized town where we did some shopping), The San Pedro Riparian National Conservation Area, Bisbee, and some other places down the rabbit hole we didn’t visit. The site actually isn’t a secret any more – and not just because I am blabbing about it here, but because someone else listed it on freecampsites.net recently. 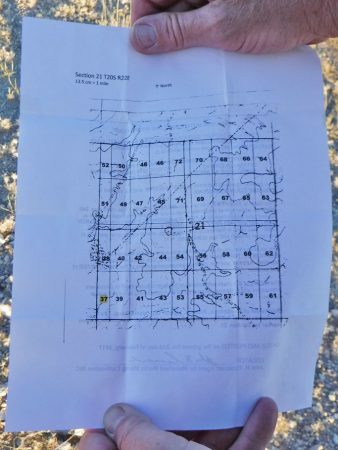 And it actually isn’t the only place to boondock off of Charleston Road, as you can see from this BLM map. (Any of the gold areas on the map not outlined in blue are good for boondocking.) As you drive down Charleston road these sites are pretty easy to spot – just look for the gates with the signs on them directing people to allow livestock to access water, to not camp within a 1/4 mile of the livestock’s water, to not destroy, injure, or molest the livestock, and oh yeah – please close the gate (lest the adequately slaked, unmolested livestock escape). * Oh, and BTW – I totally get wanting to keep a primo site secret in order that it isn’t overtaken by the masses. I mean, we tend to avoid sites with lots of other campers. But really, probably the best way to keep a secret is to not blab to the whole world that you have a secret. ** We are so far behind in this blog. We are currently in Atlanta doing our summertime deal, house sitting and working odd jobs to afford our next adventures. 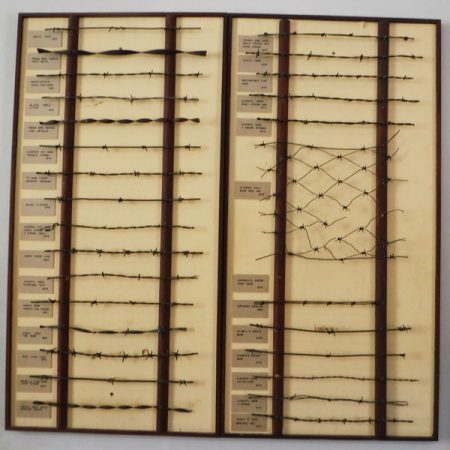 As you can see from this blog – our days were jammed packed and we had very little time for writing during our travels this winter. Never-the-less, I am determined to catch this blog up (hopefully before we attempt to sail to Mexico again this fall), because I have soooo many pictures and I’d like them to serve a better purpose than just taking up space on my hard drive. Luckily for you, though, hopefully I have forgotten the most tedious of details which should make the stories shorter, thus more interesting. *** As always, all pictures are click to enlarge. 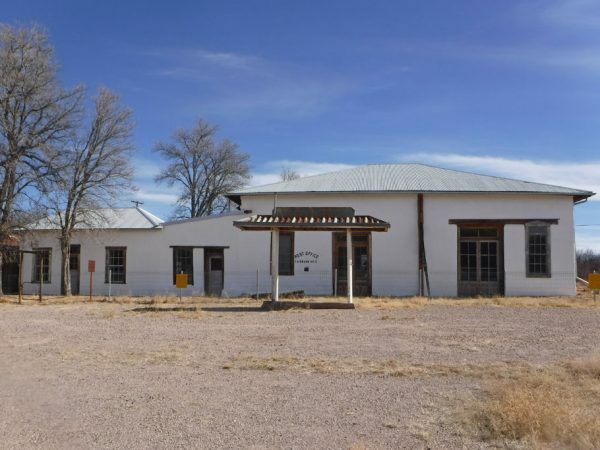 On our way to Tombstone we stopped at the Ghost Town of Fairbank. Fairbank was a bustling railroad town during the Tombstone silver boom. At one time four different railroads operated in the town. The last one closed in 1966, taking most of the town’s jobs with it. Despite the train depot closing taking most of the jobs with it, the Fairbank Mercantile survived as a store, post office and gas station until giving it up to the ghosts in 1972. The town was founded when the New Mexico and Arizona Railroad reached the junction of the San Pedro (pictured here) and Babocomari rivers. 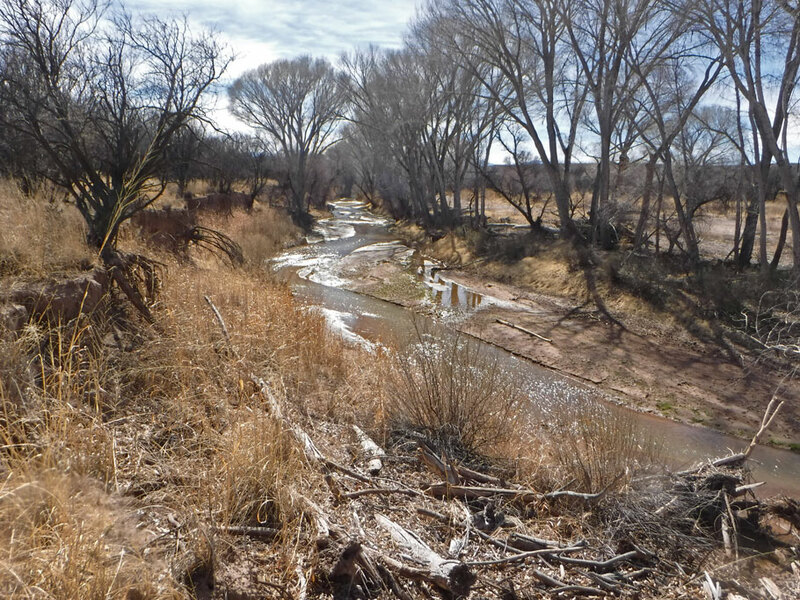 We are in the northern part of the San Perdro Riparian National Conservation Area. More about that later. 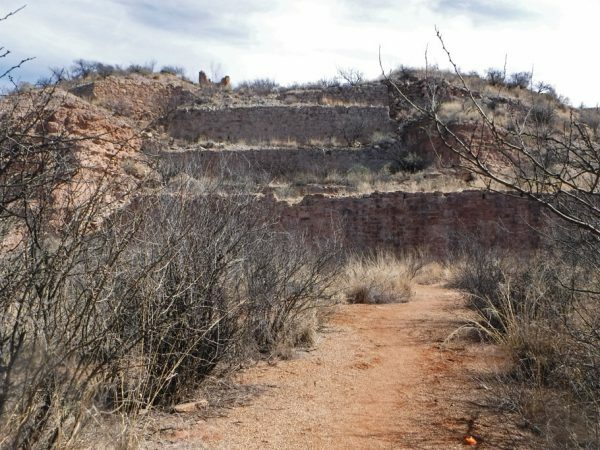 Just outside of Fairbank stands the rock wall of a silver processing mill, the Grand Central Mill which processed silver ore from nearby Tombstone. Most stamp mills were built against hills to use the force of the gravity of falling water to generate power. 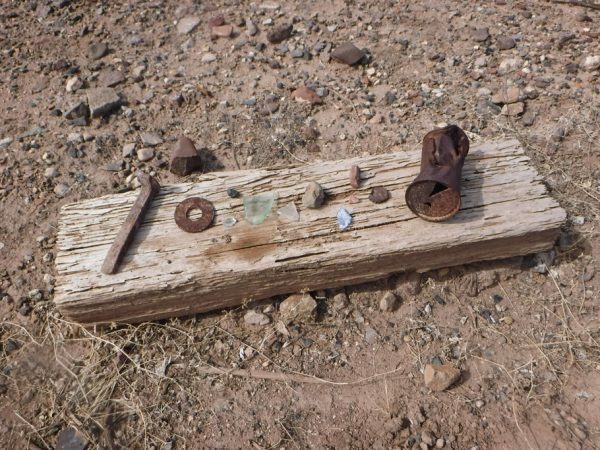 The stamps were metal rods that fell continously until the ore was broken into a powder. Water turned the mixture into a paste, mercury was added and then the mixture was heated causing the mercury to vaporize leaving the extracted silver. The mill was run for 24 hours a day, 7 days a week and the deafening noise of the stamps could be heard for miles. 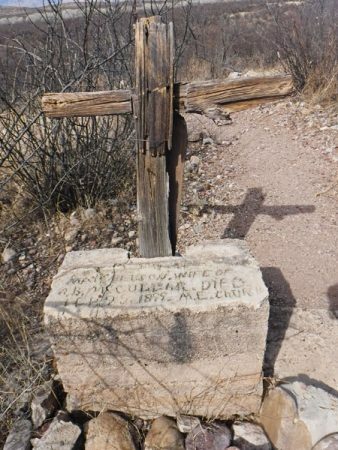 What’s a Ghost Town without a cemetery? A short hike out of town, up a hill we found the markers of former Fairbank residents. The town had a population of about 300 in the 1890s. A grave marker form 1899. Ghost Town trash. 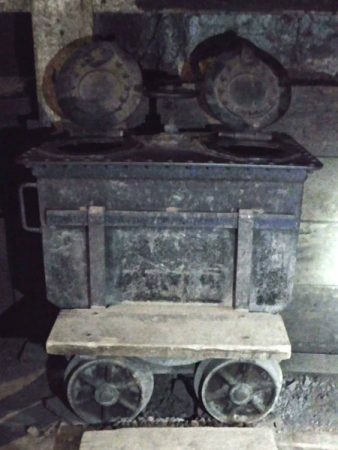 Stuff like this is found all over the Fairbank site. Signs instruct that this is not actually trash, but artifacts and that we should leave it where it was found. Our “secret” boondocking site near Tombstone. Parking on a slab is the best and it is very curious how often you can find a slab out in the middle of nowhere. 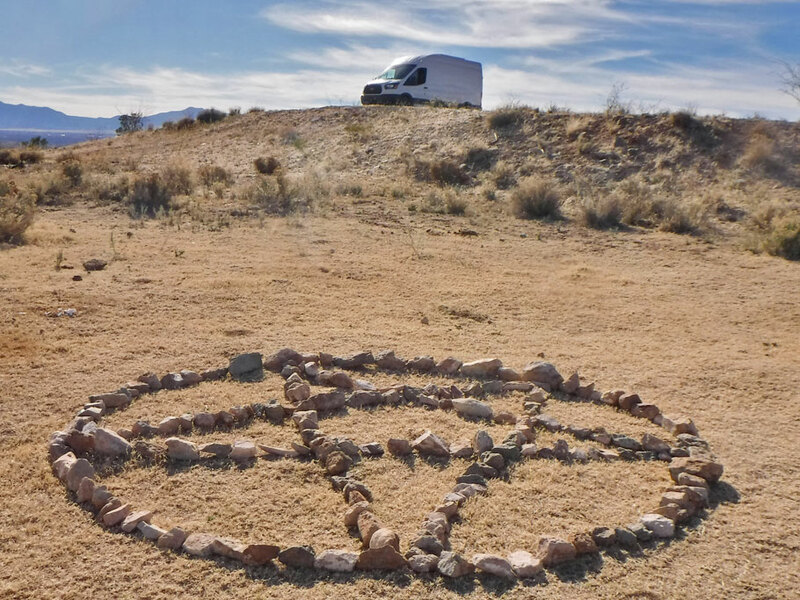 A little artful placement of rocks we found at the boondocking site. 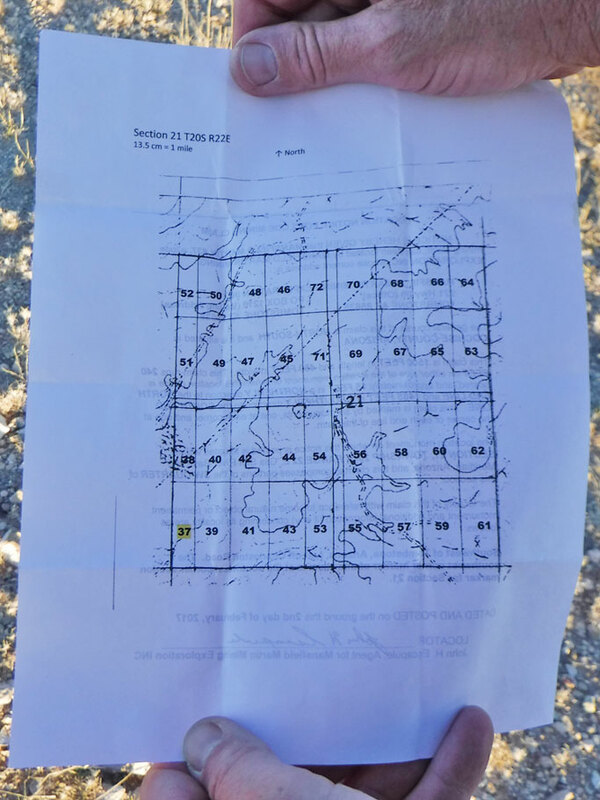 We found a post with a mining claim in a plastic bag duct taped to it at the campsite. No mine here (yet). While we boondocking near Tombstone another one of those national political protests occured. 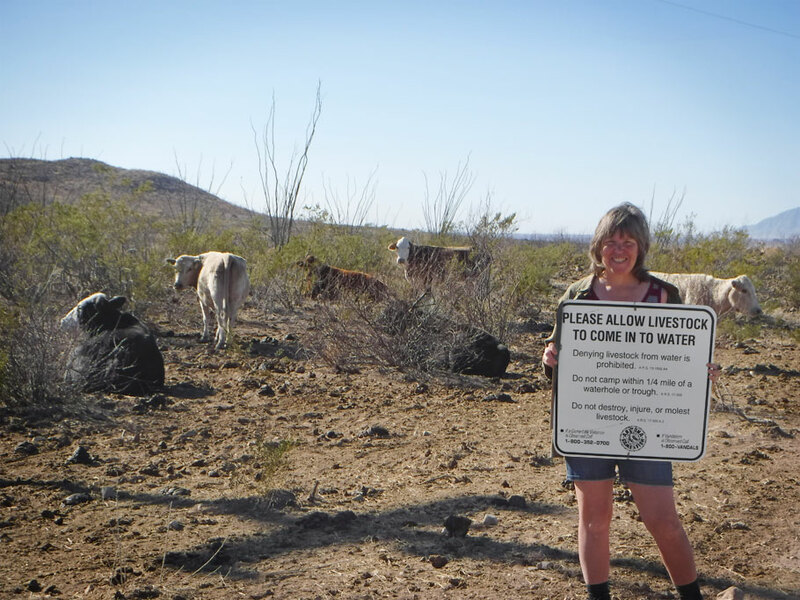 Since we were not near any major cities, I made a sign and took a pic with the cows. And since we aren’t doing politics here in this blog, I have replaced the sign through the miracle of Photoshop with the sign posted on the gate to the campsite. From our campsite we took a day trip to Tombstone. Tombstone is full of real history and legends, but unfortunately it has become a tourist trap and almost everything costs money. We had to set ourselves a small budget and pick and choose what we wanted to do. 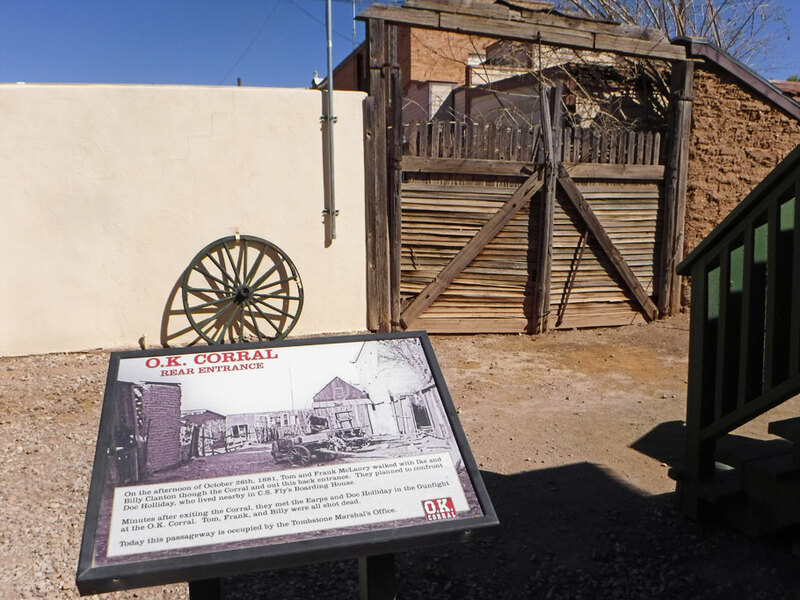 We visited the OK Corral museum, but decided not to pay the extra money to see the gun fight reenactment beyond these doors. Here at Tombstone’s Boot Hill lie the real losers of the fight at the OK Corral. Hanged by mistake? 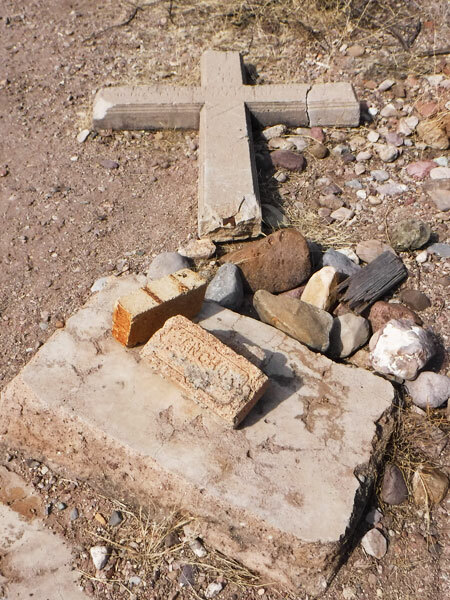 Most of the graves here at Boot Hill were filled in a few short years. And very few of the residents died of old age in their beds. Tombstone. Not pictured is the Historama attraction. Seated viewers watch as circular diorama is shifted to depict different times from the history of the town to tough to die. Built in 1964, the Historama is narrated by Vincent Price. No photography allowed. 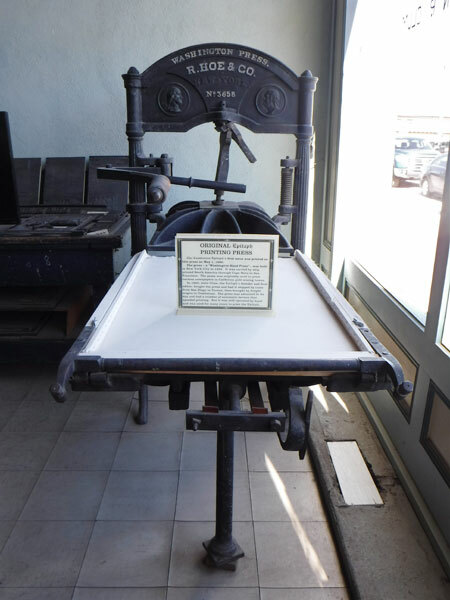 The museum for the Tombstone Epitaph newspaper had some nice displays. The paper was founded in 1880 by John Clum, Indian Agent, Mayor of Tombstone, newspaper man, and Postal Inspector for the Alaskan Territory. Here is the original printing press for the newspaper. Made in NY. Shipped to San Francisco. 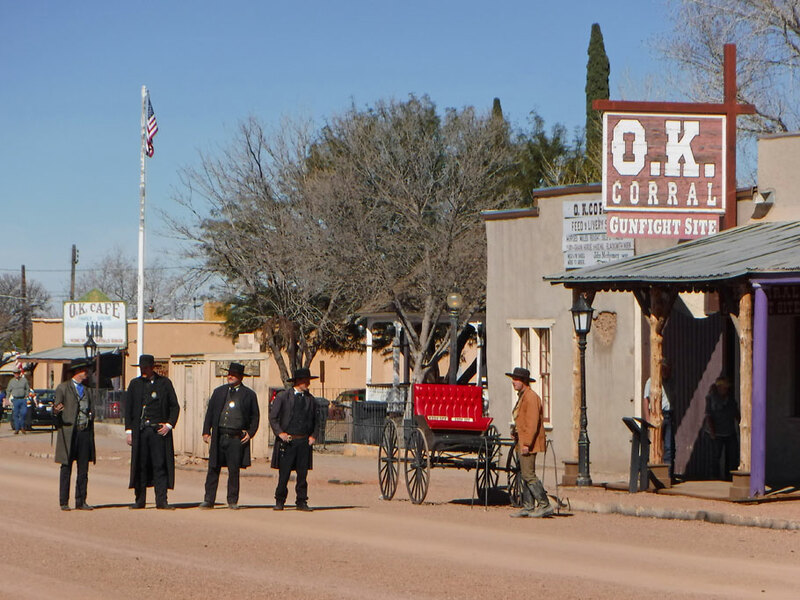 Hauled overland to Tombstone. The newspaper still publishes today. 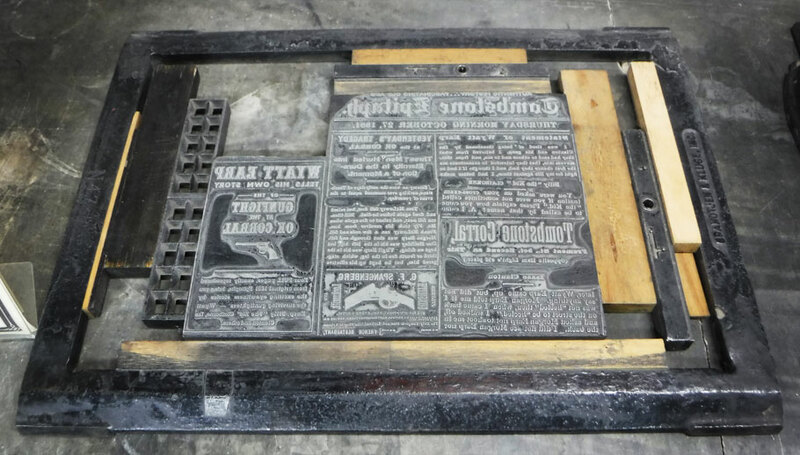 Typeface for a printing press. A good editor could read backwards very quickly and correct mistakes before they were printed. 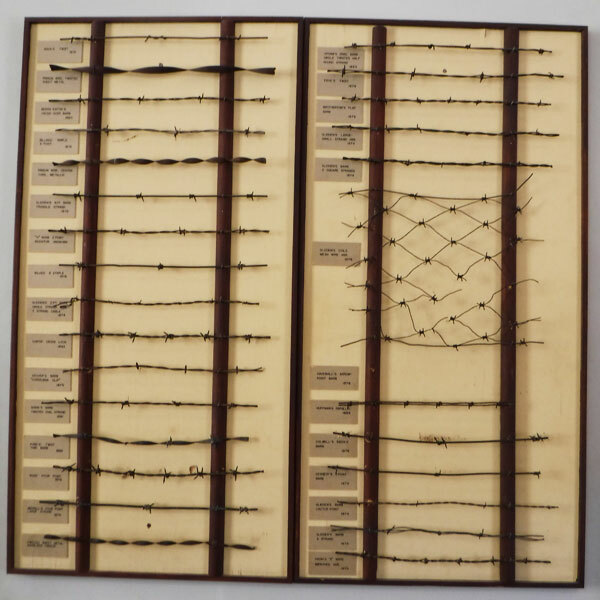 Here are varieties of barbed wire from an exhibit at the Tombstone courthouse museum. This type of fencing has been called the invention that tamed the west. The courthouse has a separate fee, but the interesting exhibits make it worthwhile. Another exhibit from the Tombstone Courthouse, equipment for assaying silver. 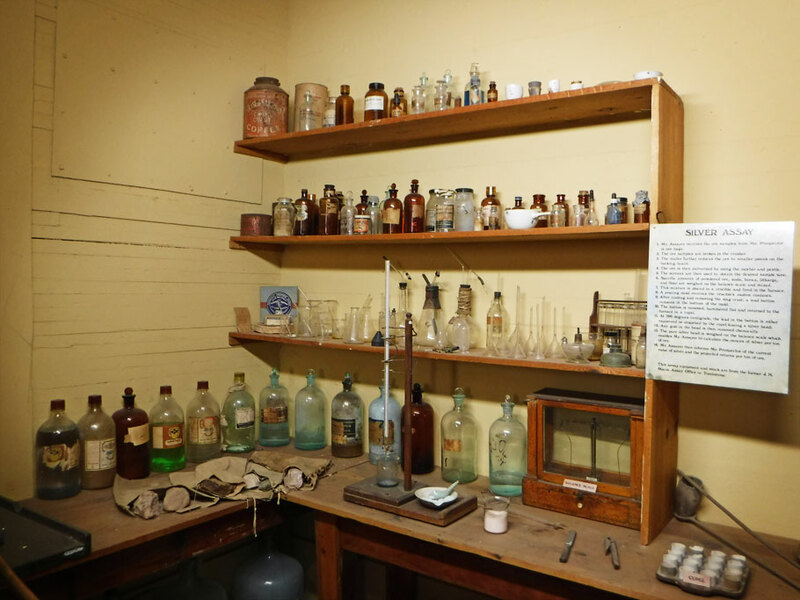 From small samples the assayer could give miners a price per ton of ore. There is still a lot of ore in the big mine here. 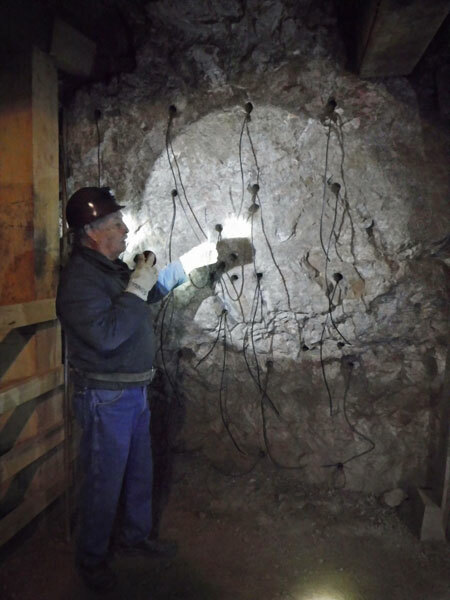 But it, along with a lot of expensive mining equipment, was buried when the mine flooded. 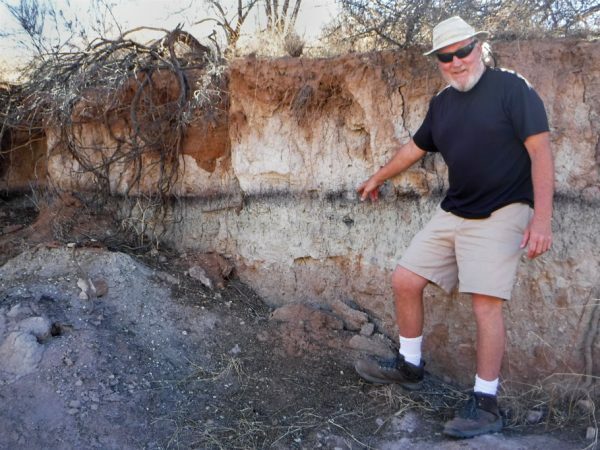 Next day Greg had to visit the Murray Springs Clovis site. It’s SW of Tombstone in the center of San Pedro Riparian. Fossils show that our ancesters killed a mammoth here 13,000 years ago. 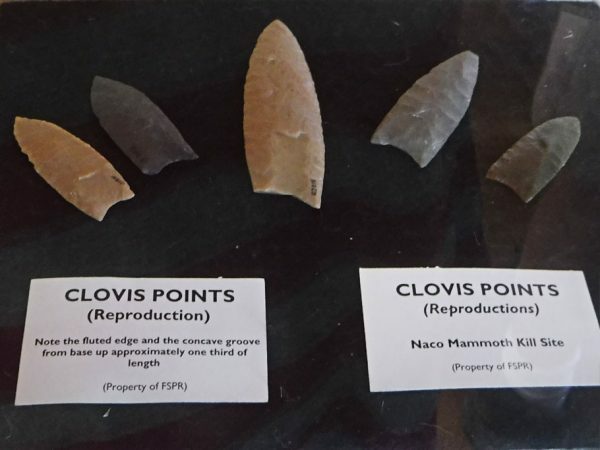 These are replicas of your standard mammoth killing tools. Greg points to the Clanton Layer in the Murray Springs site. The black layer is organic remains from 10K years ago when this area was more lush. It was named by one of the Clanton boys. The site where the mammoth was killed and butchered is below the layer, close to this spot. 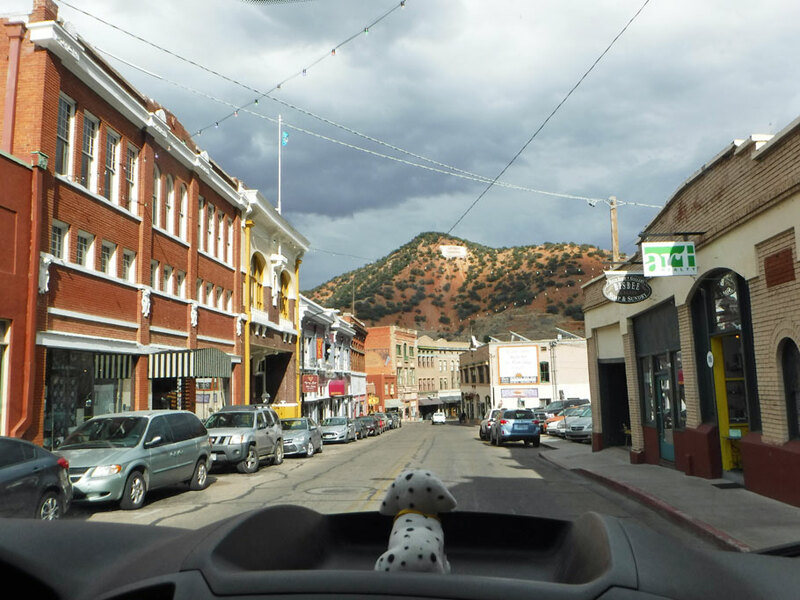 After overnighting on our concrete pad again, we drove to Bisbee, AZ. 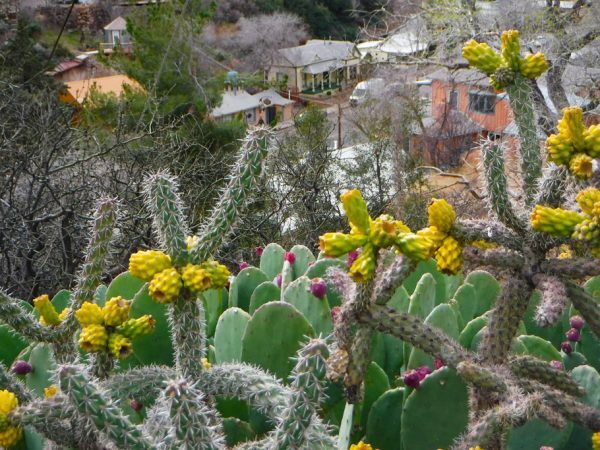 Like Tombstone, Bisbee was established as a mining town. No dramatic corral shootouts here, so they’ve had to settle with becoming a scenic artsy community. One touristy thing to do in Bisbee is visit the Queen Mine. Here Greg is ready to descend with his hard hat, day-glo vest and lamp. 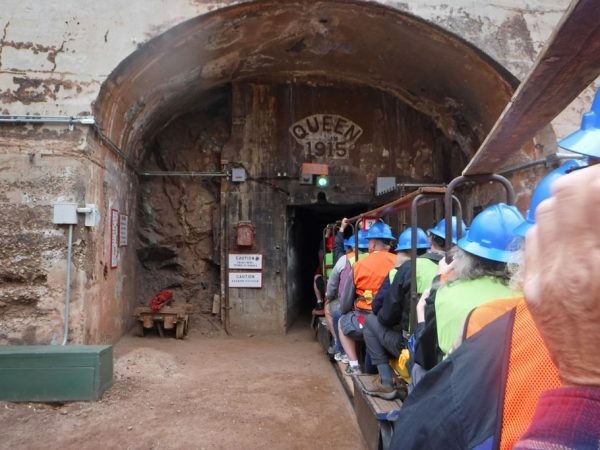 Entering the Queen Mine. 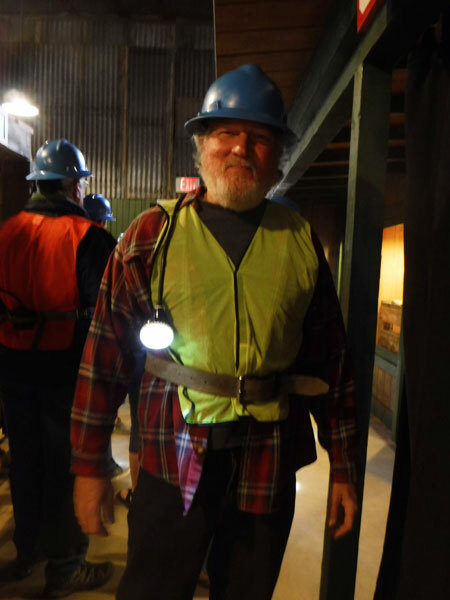 It was a very informative tour led by a former miner, who showed us how to spot copper, silver and gold ores. Mining made Bob thirsty. He searches the streets of Bisbee for a pub. View looking down from a Bisbee hilltop to Ballena Blanca (after pub visit). 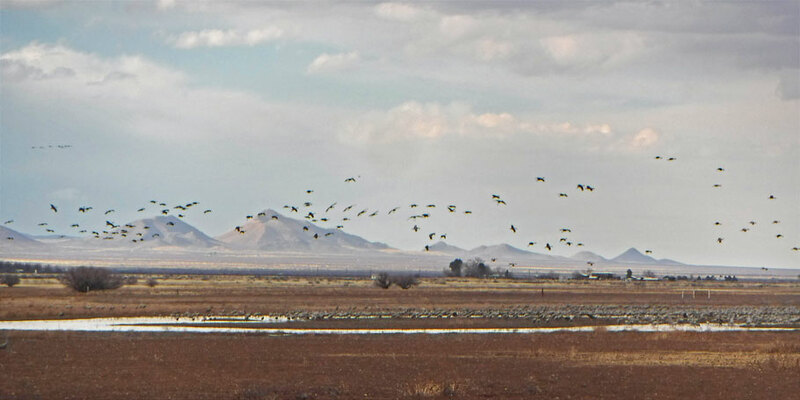 From Bisbee we drove to AZ Game and Fish Dept’s Whitewater Draw; winter nesting place for Sandhill Cranes. Whitewater Draw has a few camping spots around a pit toilet. There is a nice walkway out into the wetlands where birders point their big lenses at the cranes and waterfowl. We spent the night here. 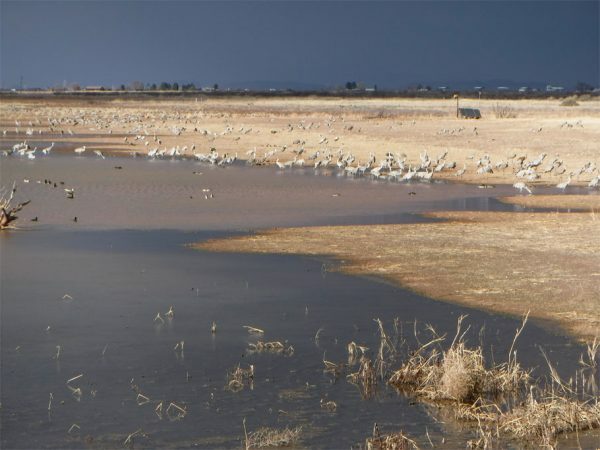 Sandhill Cranes at Whitewater Draw, with ducks in the foreground. The cranes are wintering here. Some come from as far north as Canada. We are the interlopers here. The Sandhill Crane species has the oldest confirmed avian fossil record by far, 2.5 million years. 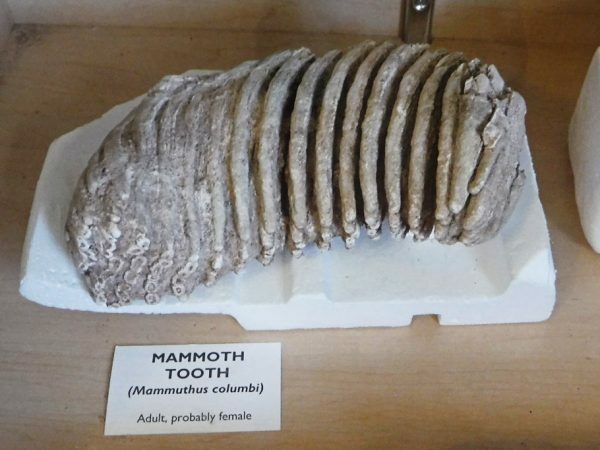 And the species may be as old as 10 million years. Wonder where they wintered 10 million years ago. 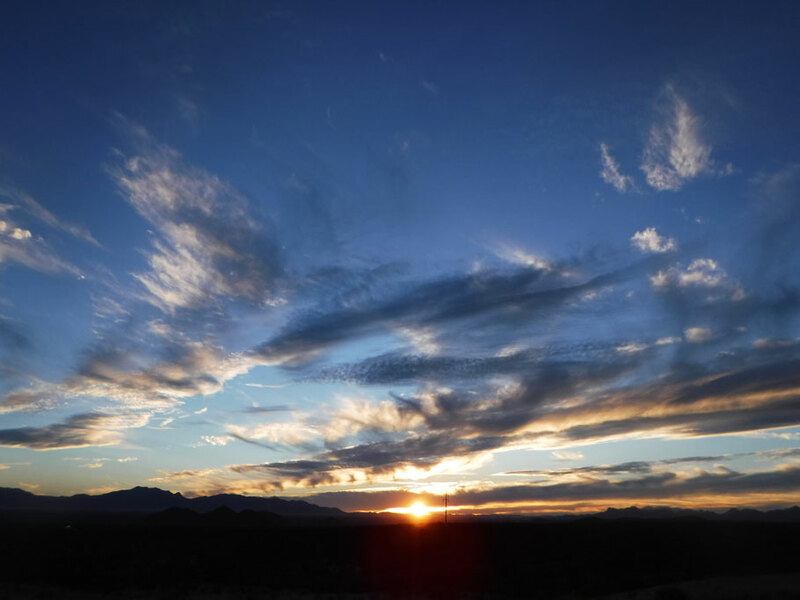 There is more flight activity near sunrise as birds leave to find food, and at sunset when they return to the draw. This entry was posted in Arizona, Travel On The Dirt and tagged Arizona, Bisbee, BLM, boondocking, Cemetary, Fairbank Ghost Town, mine tour, mining, Murray Springs Clovis site, O.K. Corral, San Pedro Riparian, sandhill cranes, Tombstone, Tombstone Epitaph, White Water Draw. Bookmark the permalink. Always a delight reading these. Did you see my favorite tombstone? There is such a secrecy around boondocking sites. I remember meeting someone who told me I should never disclose the site we were camping at or something dire would happen to me. We wrote about it on our blog, but didn’t say where it was and got a lot of flak for it. A few months later, a big blogger blogged about it telling everyone where it was so I guess the secret is out.